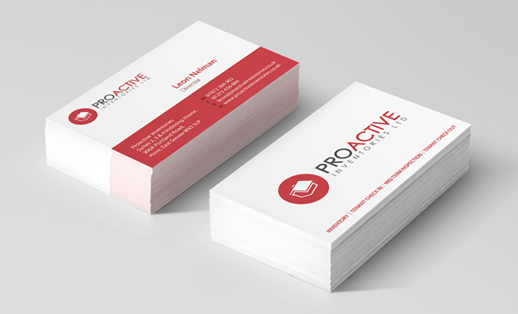 These are our most popular type of printed business card. You just need to think about your budget. The 350gsm laminated cards (matt, velvet or gloss) start from £20 a set. The 400gsm matt laminated start from £35 a set, 450gsm (most cost effective for 1000) and super thick 600gsm matt laminated cards starting from £65 a set. Or the Mohawk Superfine range of 500gsm to 1295gsm from £45 a set. Why not order a sample pack for some free samples and see the difference? What is two + five? The aminated cards are available with 3 different laminates. Matt laminate, Velvet laminate (also known as soft-touch), and gloss laminate. It protects the cards, from scratches and wear. It feels luxurious, silky and smooth. It can really have an impact when handing the card to that potential client. It feels like velvet, and very similar to a material called 'Plike' - a very different feel than matt or gloss laminate. The first batch of cards turned up on Friday as promised, and the laminated business cards turned up early this week, again as promised. I'm really happy with how they look and the service you and your team provided. I'd highly recommend FMG to friends and colleagues in the future. Cheers, Al.